But finding and selecting the right ones isn’t always easy. The first step towards an improved workforce lies in identifying what it is exactly that makes your company stand out from the rest. Find that out and you’ll also know what you need to look for in others. We can help you detect and define your success predictors. No two companies are the same. What works best for a multinational corporation may not hold up in an enterprising start-up. Luckily, our platform can easily be customised to fit the exact needs of its users. You can either choose from our wide variety of available assessment and development solutions or you can request new dimensions tailored to your particular requirements. We’ve strived to make our assessment process as simple and intuitive as possible. Our dedicated team will set up an online account and walk you through the process of creating job profiles and sending out invitations to candidates. At the end, we’ll provide you with easy-to-understand results that can be successfully interpreted by readers with no technical background. Feel free to drop us a line if you want to know more about our assessment process. the extensive reports provided by the GR8PI platform are an invaluable tool for any organisation looking to improve itself. there is no better way to make the most out of your greatest asset – your employees. Contact us in order to see how you can stand to benefit from our platform. A: For many reasons! First of all, you can connect your assessments with your Key Performance Indicators and determine the strengths and development needs of your employees. You will no longer have to assess irrelevant competencies and collect data you basically don’t need. Secondly, you pay exactly for what you use. With traditional vendors, you have to measure a predetermined number of scales and you have to pay for the full assessment no matter if you need it or not. Another, and perhaps even more important implication is that you also have to put your candidates through extensive and unnecessary testing when attracting candidates to apply for a job in your organisation. Furthermore, you can create your own design and content for your reports. A: We don’t believe in charging for things you don’t need or want. If you create an assessment or survey measuring for instance 8 different dimensions – for example, the Big 5 dimensions and 3 cognitive dimensions – you only pay for 8 dimensions. If you have more extensive needs for customisation – like creating unique assessments, reporting etc. specifically tailored only to your organisation – we offer full customisation. Full customisation is a process of typically 3-4 months including developing measures assessing precisely the values, behaviours, competencies etc. specifically identifying your company’s key performance indicators, and critical to your organisation’s success. A: In that case, the GR8PI platform is exactly what you are looking for! You will always be able to create your own assessments, but the platform holds already an extensive number of assessment templates which you can use to gather all the relevant information on your workforce.If you are already using a traditional tool you are in fact likely to find a standard template matching it. In that case, you will be thrilled to find that the GR8PI platform probably offers you much more value for money, much better reliability and much more extensive reporting than you have ever been accustomed to. A: Yes – it’s one of the major benefits you get from using the GR8PI platform! The platform will enable you to select exactly those people who fit into your organisation’s culture, who will perform at the same levels as your best existing people. On top of that, your new hires will become productive in a shorter period of time, will be more effectively engaged in their work and at the workplace, and will be motivated to stay at your company far longer. A: For sure! 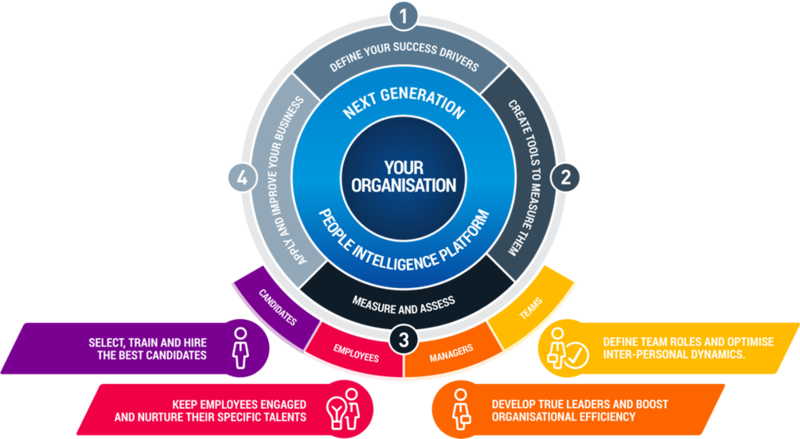 One thing is getting the right people onboard your organisation – another, and often an overlooked challenge, is to gain the maximum level of performance from your existing people. The GR8PI platform enables you to onboard the right people and proactively develop your existing staff. The result is happier, more loyal and better-producing people in the entire organisation, positively impacting the bottom line! A: In that case, the GR8PI platform provides you with hundreds of pre-defined job profiles. All you need to do is to match your candidate’s assessment results against a suitable pre-defined job profile and generate the reports you need. As you build on your acquired knowledge of what defines a high performing employee in your organisation you have the options to either improve the pre-defined job profile or create a new one encompassing exactly those performance drivers that characterise each particular job. A: Yes it does! First of all, we empower you to customise everything on the platform, from invitations to reports, including adding your own branding videos, social media connections etc. We also provide you with candidate-specific reports, also branded in your name, helping you to stay connected with candidates, even if they didn’t qualify for a position at your company. A: Definitely! If you are familiar with using assessments, you probably know all about how important it is that they are valid and reliable. We exceed all standards and dare to say that only a few – if any – of the traditional vendors meet our level of quality and innovation. A: It does! For instance, we know for sure that many candidates and employees don’t achieve 100% fit to the job. For reasons like this, but also to help your talent constantly grow and develop, the platform offers online training and videos designed to close the “gaps”. Of course, such training is individually adapted, based on the assessment data and the unique requirements of the job.With this approach, we minimise your training efforts and costs. More and more services are constantly added to the platform. A: Absolutely not! The platform is very intuitive and easy to use. Even when you use all the standard customisation capabilities available – including creating your own assessments from our extensive library of dimensions – no certification or training is required. However, if you would like to be trained or need assistance, we are of course always there for you! A: It’s very simple! If you create an assessment or questionnaire measuring for instance 8 different dimensions – for example, the Big 5 dimensions and 3 cognitive dimensions – you only pay for 8 dimensions. If you use a standard assessment template, you pay for the number of dimensions included in that template. We don’t believe in charging for things you don’t need or want! A: Finally you don’t have to shop around in different countries to get the best price for the same product or service! Our pricing model is strongly influenced by the IMF (International Monetary Fund) GDP/Person statistics and does not depend on where you buy, but where you consume. It may sound complicated, but it is all seamlessly managed by the GR8PI platform – and of course, you’ll have comprehensive statistics and reporting showing where you consumed our products and services, and the local price you paid for it. Q: What do I need in order to use the GR8PI platform? A: All you need is access to the Internet and a browser. The GR8PI platform is a global SaaS, Cloud-based solution. This also means that the platform is truly scalable. A: We have development hubs in Europe, USA and Asia. Besides attracting the best developers available, our development hubs also provide a reliable and global platform support.